Chances are you received at least one gift card this week. According to the National Retail Federation, gift-card spending this holiday season was expected to reach an all-time high. Eighty percent of consumers said they planned to buy these oh-so-personal pieces of plastic. But, as we all know, gift cards often go unspent — or half-spent, with a nominal balance left on them for all of retail eternity. So if you’d rather turn them in for cash or another brand-name gift card, this column might help you out. What follows are some possible questions about how online gift-card exchanges work. My answers are based on conversations with three different gift-card-exchange companies, along with information supplied by the NRF and online retail giants like Apple and Amazon. My grandmother thought it was a good idea to give me a baby-store gift card as a hint (I don’t have kids). But the store won’t take the card back and give me cash. Which websites will buy it from me? The sites I used for my reporting are Cardpool.com, CardCash and the relatively new Raise.com. These all perform two functions: They let you sell your unwanted gift cards, and they’re also a marketplace in which you can buy used or discounted cards. I’ll say this: A lot of these websites look like they could use a makeover. I found Raise to be one of the exceptions, having a nicely designed, easy-to-navigate website. But more important than the aesthetics is the validity of the websites, and what their fee structures are. So you’ll want to evaluate those carefully. Can I get the full amount back if I sell the card through one of these sites? Generally, no. These exchanges either charge a listing fee or take commission on the sale of the card. So either way you’re losing out a little bit. 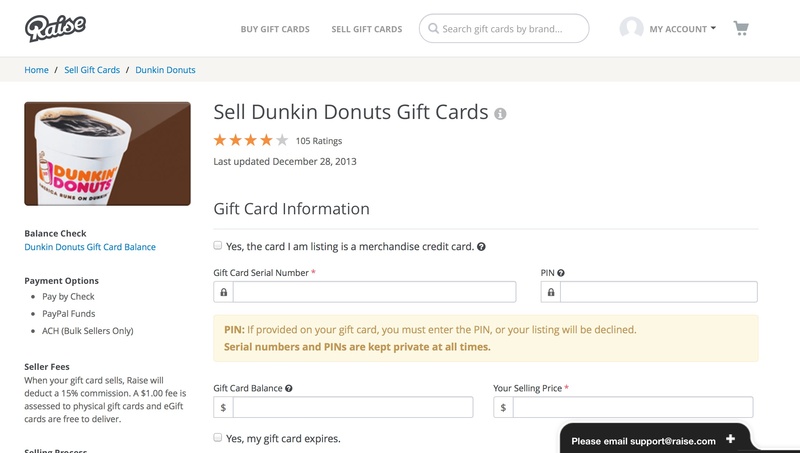 Raise acts like a kind of StubHub for gift cards, letting you list your unwanted gift card at your own price. For example, Raise, which acts like a StubHub for gift cards, does let you set your own price for the card, as long as the list price doesn’t exceed the value of the card. But Raise also charges a $1 fee to list a physical card in its marketplace. Then, if a person buys your card from the Raise market, the company deducts a 15 percent commission. CardCash, on the other hand, will buy your unused gift card from you outright — so you don’t have to wait for another person to buy it. But the difference is that CardCash will offer you anywhere from 65 to 90 percent of the value of the card, depending on market demand. Cardpool and others work similarly. 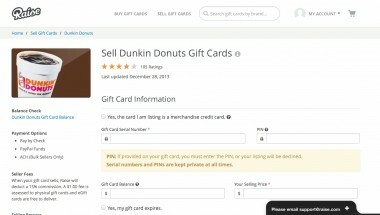 When I went to list a $25 Dunkin’ Donuts gift card on Cardpool, the site offered me $20 for it. I only have $.67 left on a Trader Joe’s card. Can I sell that? Some services set a minimum amount. Raise requires that cards have at least $10 on them before you list the card on the marketplace. Cardpool has a set minimum of $25. But CardCash will take any amount — so, yes, even your $.67 Trader Joe’s card. Another well-intentioned family member bought me a gift certificate to a small local restaurant. But I’m from out of town. Can I sell the gift card even if it’s not a chain restaurant? Most exchanges only accept gift cards for national or regional brands. Raise allows you to list gift cards from local businesses — but, of course, the market for it will be smaller, and it may not sell. Do I have to actually go to the post office to mail the cards out once I decide to sell them? And do I have to pay for shipping? 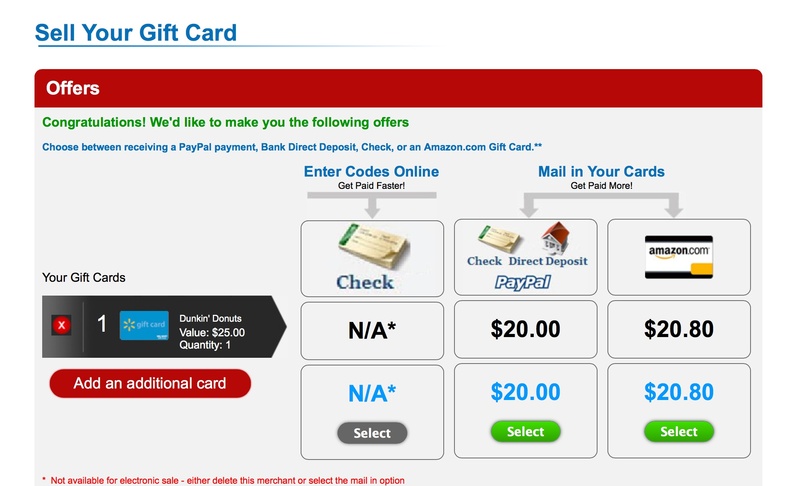 Some exchange sites now offer e-cards or vouchers as a way to buy and sell gift cards more immediately, but it depends on each store or merchant (dealing with e-cards can make these sites more vulnerable to fraud issues). CardCash will buy your gift cards from you outright — at 60 percent to 85 percent of the card’s value. Otherwise, you’re going to have to drop your card off at the post office or a local mailbox, and you might have to pay for a stamp or shipping. It’s advisable that you pay a little bit more for shipping with tracking, even though that means you’re spending money to get money. How long will it take for me to get my money? And in what form will it arrive? In most cases, you’re going to have to take a leap of faith and mail the gift card before you receive payment. If you don’t receive payment, or if you’re the one buying a discounted gift card and you get a dud card, you may have been scammed by a third-party buyer. Some — but only some — sites have clear-cut policies that cover you in this instance, promising to pay the full amount of the sale to you within a certain time period. I got a bunch of iTunes gift cards this holiday season. Can’t I just return these to the Apple Store for cash and avoid using these websites? 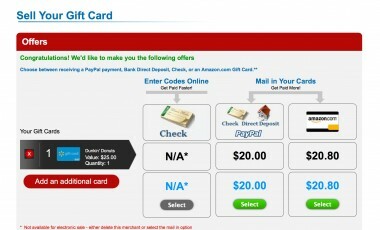 Some gift-card websites will let you buy or sell e-cards, which means you won’t have to mail out the physical gift card, but it depends on each merchant. The exceptions are a handful of states where consumers can legally be paid out if the card balance dips below a certain amount, usually $10 or less. Okay. I guess I’ll use a gift-card exchange. But I hear a lot of horror stories about fraudsters. How can I avoid scams? Raise says each gift card is verified at the time of listing and time of delivery. CardCash also claims to verify the balance of each card that is sold through its site. And Cardpool says it has invested a “large amount of money” into protection and security. But you can really never be too careful. I asked the National Retail Federation this same question, and the organization’s response was clear: The best way to avoid scams is to refrain from using third-party exchanges, as some sites don’t verify balances. Feature photo courtesy of Rivka YYZ/Flickr Creative Commons.